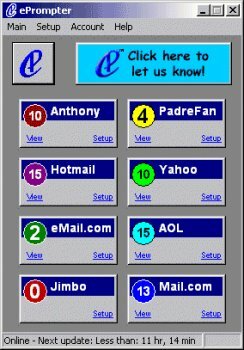 ePrompter is an email retrieval and notification utility that automatically checks eight email accounts for AOL, AltaVista, Earthlink, Email.com, Hotmail, Juno, Lycos, Mail.com, Mindspring, MSN, Netscape, POP3, Rediffmail, USA, Yahoo, ZDNetOneBox and hundreds of other email domains - all at the same time, featuring a unique screensaver and a rotating tray icon that let you know at a glance the current status of your selected email accounts, whether your computer is online or offline. POP Peeper is a lot better. Admittedly I got a narky response on the POP Peeper forums when I asked about softhome.net support, but still. This program, on the other hand, has a woeful interface AND it doesn't support softhome.net either. Forget it. I used to be a big fan of ePrompter but my needs have exceeded ePrompter's features and I had to migrate to POP Peeper. If you have FREE Yahoo, Hotmail, Lycos, etc accounts, this is a must. For POP accounts, there may be alternatives. But for the free services that otherwise require you to login to their sites, THIS IS THE ONE PERIOD!!! I've used this one for years now. Granted, there may be times when it will quit working for a specific service. Yahoo, Hotmail, and others change the login procedure from time to time. This is the providers causing this, NOT ePrompter. The ePrompter team usually has a fix in a matter of days. It might be ok, or they say it's ok, it might even be safe, but I can't know what they do. POP Peeper NEVER connects to their server, unless you specifically ASK to check for updates. Overall, this version is a must-upgrade for every ePrompter fan! In terms of functionality, 5 is almost certain for everyone here, except for few fellows who have difficulties running the program. In terms of graphical UI, it's 2. Although it provides alternative layouts, all those layouts are still not quite "modern"? (what's the proper word for that, hmm...) Get the graphics better and this rock-solid piece of work would be the best (rate of 5). In terms of ease of use, most of you all are using it everyday and seldom using your Firefox/Safari/IE to login to Yahoo, Hotmail, AltaVista, etc... It shows this software is really an innovation. NICE JOB! So another 5 here. This version is extremly buggy. I recommend using ver 2.0 Build 2 EPX 1.0 (SR44). SR44 had been released a couple of days back, which was basically a fix for most of the updated mail sites (Yahoo!, Hotmail, mail.com, and more). SR44 is pretty stable and works well too. I actually use it to send and read all my mails. And the autoupdater feature is excellent! And its pretty safe too- trustable, that is. I'll try to remain neutral on this one. It does the job (for Hotmail, Yahoo! doesn't work anymore since some time, I guess Yahoo! modified the way their email server works ?!? ), but... there's something fishy below. I filter manually with my firewall what to get through or not. If you want, it's like being offered a free lunch, but you have to stick a broom up your arse. Free, yeah kind of, all good I don't think so. I still use it though, because despite this problem it still helps for my particular situation. If the Yahoo issue isn't fixed soon, I'll trash it with no remorse and without thinking twice. Almost never finishes. When it stalls none of the fixes work and it eats the remaining amount of computer cycles and everything else slows to a halt. Must be killed thru task manager to get computer back. Boo! Whenever you reply to a message, it puts a big advertisement at the bottom of your message (3 lines long) that your recipient gets. The program does have some public relations issues that the producer will have to work out, but I have been using it for at least a month and haven't seen any increase in the amout of spam I recieve on those accounts. I wouldn't use it as a main e-mail reader but it is useful to check less used e-mail accounts. I'm glad they updated it now. The older version was starting to wear off. As for if it harvest e-mails, you probably get spam from signing up with that ???? site last week :p And no it doesn't get your password because wouldn't they change it if they did? That way you couldn't log in? Duh. Does what it says, but the UI is horrid. great 4star software. does what it says.